It’s almost hard to remember now, but back in Supergirl’s first season we used to spend almost as much time with Kara Danvers as we did with Supergirl. Hell, I used to spend these reviews bemoaning the fact that the DEO half of the show wasn’t anywhere near as interesting as the CatCo stuff. Now it feels like we hardly ever see Kara out of her Supergirl costume and when we do she’s usually hanging out with her DEO friends who already know about her secret identity. 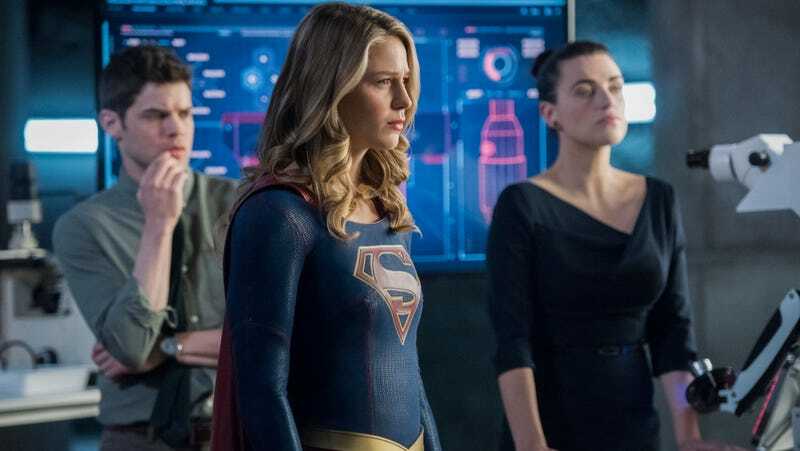 The degree to which Supergirl has dropped Kara’s double life is a frustration I’ve talked about a lot in these reviews and one that “The Fanatical” exacerbates, even as it tackles the idea of superhero secret identities head on. “The Fanatical” has a bunch of intriguing storytelling ideas, all of which suffer from being needlessly crammed into one episode. Still, I tend to prefer an episode that’s overstuffed to one that’s underdeveloped and “The Fanatical” is nothing if not overstuffed. The episode gets its title from the return of Thomas Coville’s cult, which is now being run by former devotee Olivia (Sofia Vassilieva). Olivia is determined to bring forth another Worldkiller with the help of a magical space rock and a book of instructions left behind by Coville himself. But though Coville’s cult is by far the most intriguing idea to emerge from Supergirl’s third season, this episode just doesn’t have enough time to dig into the themes of misplaced faith and corrupt devotion that the cult inspires. Instead they’re more of a villain-of-the-week threat to inspire some introspection from both Kara and James. There’s a whole essay to be written about all the ways Supergirl has attempted to reboot James Olsen over the past three years. And while I originally thought this season was going to do away with the Guardian concept all together, it’s back with a vengeance tonight as James grapples with the idea of what it would mean for his secret identity to be revealed—either by choice or by force. I consider it pretty much a universal good that mainstream TV shows are becoming more and more open about discussing the realities of race and racism. And James’ monologue about being handcuffed as a seven-year-old is both well written and very well delivered by Mehcad Brooks. Elsewhere, however, Supergirl winds up mixing its metaphors in a really messy way. James worries that if he’s unmasked, National City won’t take kindly to a black superhero; he’ll be judged by the color of his skin, not the heroism of his actions. But that idea takes it as a given that Guardian is a universally beloved figure in National City, even among the authorities. And if there’s one big tenant of comic book storytelling, it’s that masked vigilantes are pretty much always treated with skepticism and distrust. In other words, it’s hard to feel shocked by the scene where the police hold Guardian at gunpoint when we’ve seen similar scenes in pretty much every Batman movie ever made. Now, I wouldn’t be opposed to Supergirl making a more nuanced point about the ways in which black vigilantes would be treated even more suspiciously than their white counterparts. But this episode simplifies its own world-building in order to make a social point that doesn’t necessarily build on Supergirl’s previous Guardian storytelling. 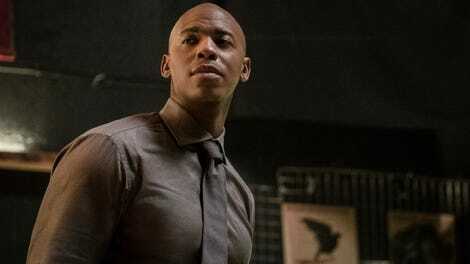 Plus the storyline ends with a weird button in which James explains that he would like to one day reveal his identity in order to serve as an example of black heroism in action, but also quickly shuts down the idea of Kara revealing hers because she’s using her secret identity to protect the people she loves. Which, what? Won’t James’ friends and family also be in danger once he reveals himself as Guardian? In trying to justify Supergirl’s status quo while simultaneously moving James’ story forward, Supergirl writes itself into a narrative corner it has to inelegantly handwave away. “Inelegant” is also the word I’d use to describe the ongoing Supergirl/Lena tension, which has escalated far too quickly and only really makes sense if you’re willing to fill in some big motivational gaps yourself. “The Fanatical” somewhat retcons Kara’s harsh anti-Kryptonite stance from the past few episodes by explaining that she was letting Kara’s friendship with Lena leak into Supergirl’s relationship with her. But while the idea of watching Kara struggle to keep her two lives separate is a great one, Supergirl doesn’t explore it to its full potential because we so seldom get to see Kara as Kara. This episode seems tailor made to juxtapose Kara/Lena scenes with Supergirl/Lena ones, but it never takes that opportunity, instead relying on the previous episode’s brief elevator scene to do all the heavy lifting. “The Fanatical” even proves the value of secret identities (at least from a storytelling point of view) when Mon-El briefly goes undercover as bumbling Mike—which is easily the best thing Chris Wood has done all season. Supergirl has a great central premise and actors who are more than capable of pulling off dueling personas, so why does it so aggressively avoid that storytelling well? Why is it so insistent on being a far more generic show about a taskforce of full-time superheroes? Still, sometimes it’s better to be frustrated by the imperfect execution of interesting ideas than to be bored by the solid execution of lackluster ones. For better or for worse, “The Fanatical” did give me a lot to think about. And there were moments in this episode that definitely felt like old school Supergirl. Supergirl reaching out to Olivia with an emotional plea and then comforting her after blasting the rock out of her hand felt very much like the show returning to its empathetic core. Now if only it could get back to the core of Kara Danvers too. I definitely thought Supergirl was going to blast Olivia’s entire hand off. The C-plot about Alex, Ruby, J’onn, and M’yrnn going to the arcade started out pretty rough, but eventually grew into something unexpectedly moving. I really liked the Ruby/M’yrnn scene as well as Alex’s attempts to help Ruby work through her fears that she might one day turn evil like her mom. Still, the whole thing felt weirdly tangential to the main storyline and only slightly thematically linked through the idea of faith. I like the detail that James stores his Guardian suit in CatCo’s private elevator. Supergirl has saved Lena’s life enough times that I’m not sure I buy Lena’s complete hostility towards her, but I appreciated Lena calling out Supergirl’s weird obsession with being friends with her. I can’t make heads or tails of J’onn warning Mon-El that confessing his love for Kara would be purely selfish. Didn’t Imra basically agree to dissolve their marriage if Mon-El wants to be with Kara? Next week: Kara and Mon-El take a road trip to space.